Take your swim to the next level with the new Aeron Wetsuit from dhb. The perfect blend of speed, flexibility, comfort and buoyancy, the Aeron Wetsuit is for competitive triathletes and swimmers looking for their next upgrade in performance. Building on the success of the top-rated dhb Hydron Wetsuit, the Aeron wetsuit takes performance up a gear with carefully considered features designed to make you faster through the water and transition. please consult the size guide carefully when ordering your wetsuit. If you fall between sizes, we recommend you go for the larger size. Using a new design across the shoulders and underarm means this suit offers enhanced flexibility through the stroke, aiding propulsion through the water. 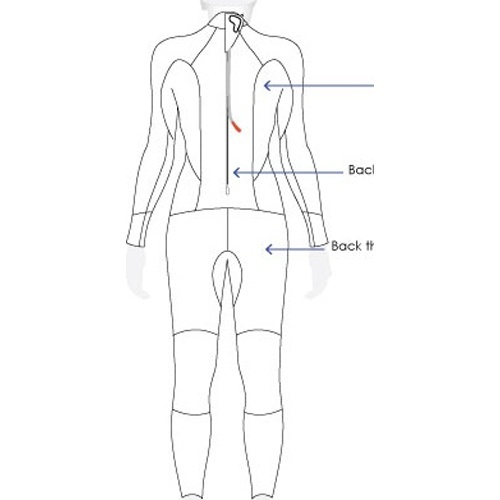 By using thinner, more flexible neoprene (1.5-2mm), in combination with robust seam construction in these areas, dhb have made sure the Aeron suit won’t hold you back, stroke after stroke. Carefully position leg seams further improve movement through the water. The Aeron suit features a full SCS (Super Composite Skin) coating which works to keep you slippery and streamlined through the water, reducing drag. With the added benefit of increased surface strength, this coating makes the Aeron wetsuit more resilient to the bumps and scrapes that are all part of competitive swimming. For a rapid transition, quick release arm and leg cuffs and a quality YKK zipper ensure your just as fast out of the water as in it. Designed for progressing triathletes and swimmers, the Aeron suit features gender specific, performance-focused buoyancy (3-4.5mm neoprene in the lower body). By using variable neoprene thickness across the suit, dhb have created buoyancy without compromising on speed. Targeting improved buoyancy on the upper body balances the natural buoyancy of the hips, helping to achieve a downhill swimming position that cuts through the water. With a new pattern of panels and the use of multiple thicknesses of neoprene, this suit offers a snug, compressive fit without any compromise in flexibility. A low neckline adds comfort. Please be sure to refer to size guide to make sure of the correct size.